The employees in this division pick up commercial cardboard, clear plastic and office paper and transport it to our cardboard recycling facility in Moruya. As agents for Amcor, Visy and Cleanaway we receive and process large quantities of cardboard. Yumaro offer a confidential document shredding service for sensitive material. 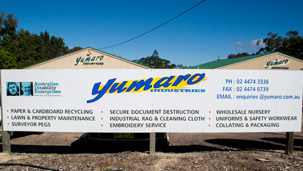 Yumaro has a textile division which produces a variety of products for companies such as Bluescope, Flagstaff, Woolworths, Ensign and the Eurobodalla Shire Council. 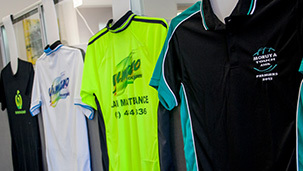 We also offer an embroidery and Direct-To-Garment printing service for business, sporting groups, clubs and leisurewear. Our employees provide the business and private sectors with a regular lawn mowing service. 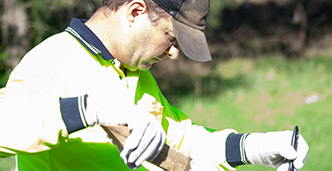 Our employees produce survey pegs (450mm, 600mm and 900mm) and guide posts on behalf of the Eurobodalla Shire Council and other businesses. Yumaro supply cleaning cloth and industrial rag (recycled towelling) in 5kg bags to local businesses. 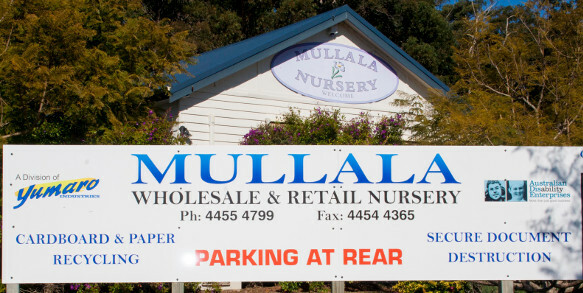 Yumaro owns a nursery in Ulladulla. It is a wholesale and retail nursery supplying plants to customers from Wollongong to Narooma. The nursery produces high quality native and exotic plants for landscape, commercial and domestic use.